The latest update to Alexa's iOS app delivers long-awaited voice control to the virtual assistant software. Previously, the app was largely relegated to interactions with Amazon Echo speakers, for example setting up a new device or placing calls to other users. With the latest revision, Alexa acts more like a full-fledged smart assistant. 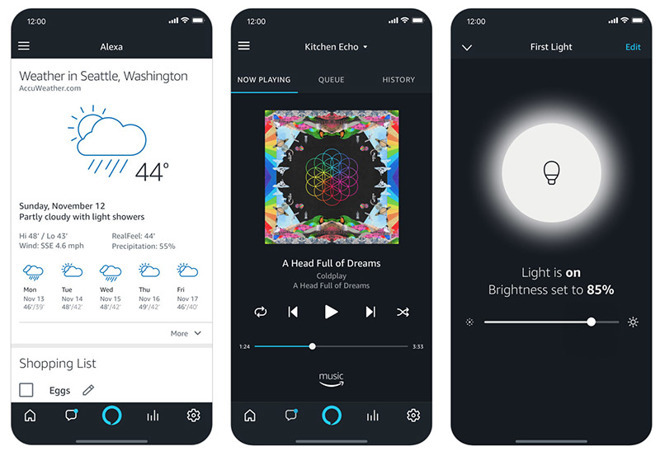 Users are able to tap the dedicated Alexa button — a text bubble-like icon — and use their voice to control smart home appliances, play music, check the weather, ask general queries and more. Certain skills, like those pertaining to calendar entries and sports scores, are accompanied by in-app screens that display information graphically. Much like an Echo device, and Apple's own Siri, the Alexa app connects to offsite servers to carry out processing. Due to Apple's tight control over hardware access, Alexa is unable to monitor for wake words, meaning users must use the app's GUI to input a command or query. Still, voice interactions imbue the app with a sense of familiarity for existing Echo device owners. More importantly for Amazon, Alexa on iOS gives iPhone and iPad users a portable and direct line of communication with the virtual assistant. Amazon initially promised voice support for Alexa's iOS app in January after rolling out a similar feature on Android. Alexa for iOS is a free download from the App Store.